Ooops a day late posting these. Got all caught up looking at bikes yesterday. The pedal kind. So excited about getting one finally. Especially with gas prices climbing more and more….and it isn’t even summer yet!! Time to find a better solution for those errands that are not within comfortable walking distance…which are a few. We are a bit out of the way here. Anyways! Hot cross buns. Those nummy treats that start coming out every spring. You see them there, taunting you, begging you to devour their souls….ummm….yeah. You get the idea. If you have a bread machine you can skip all this by using the dough cycle according to your manufacturers directions. Heat milk to lukewarm and pour over the yeast, carefully. In a large bowl combine the flour, salt, sugar, and spices. Make a well in the center and pour in the milk mixture. Stir and add the eggs and then the margarines. Fold in the raisins and cranberries. Once they are evenly mixed in cover the bowl with plastic wrap and allow to rise to double it’s size. This usually takes about 2 hours. Once risen, grab pieces of the dough and shape into 18 buns and place on a baking sheet. Allow to rise again slightly for about 30 minutes. 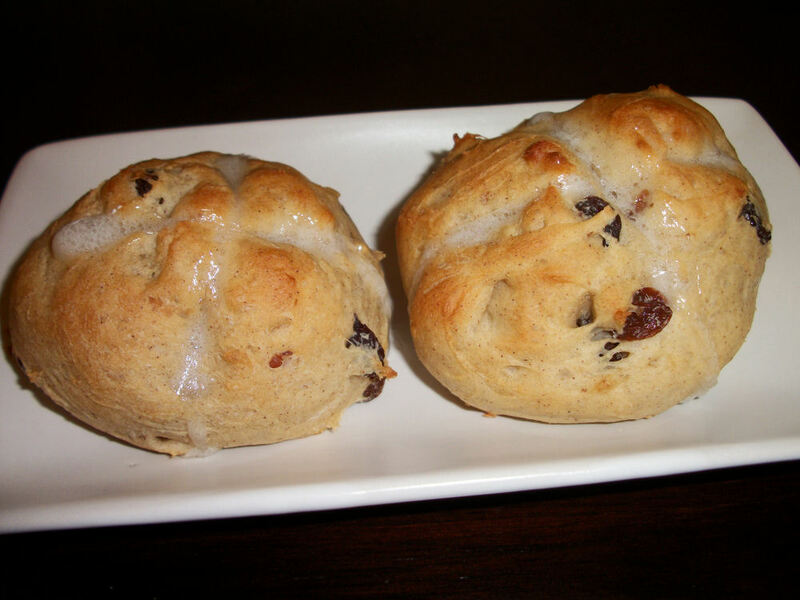 Use scissors to snip the buns deeply in the form of a cross. Bake at 425F for 10 minutes or until golden brown. If you would like to glaze them I suggest a 1/2 cup icing sugar (if you can find the no calorie stuff even better) and about 1 tbl of lemon juice. Drizzle over hot buns. Makes 18 buns. Each bun contains 112 calories, .8 gram of fat, 1.7 grams of fibre, 4 grams of protein, and 23 grams of carbs. These are tasty still warm and are sacrilegiously tasty first thing in the morning. This entry was posted in Breakfast, Comfort Foods, Craving Buster, Dessert, Snack and tagged Cinnamon, cranberry, Raisins. Bookmark the permalink.